The Leatherby Libraries are committed to providing access to library services for all patrons in the Chapman community. The Library provides access to research materials and services through reasonable accommodations such as readily accessible adaptive technology and software, special equipment and personal assistance. The following information is provided to help users with disabilities make the most efficient use of library facilities, materials and services. The east and west facing library entrances are equipped with wheelchair ramps and automatic entrance/exits doors. The library has three elevators with access to all floors. Service is available at all public service counters. Most workstations and desks are wheelchair accessible. Disabled access parking spaces are available in the Lastinger Parking Structure located next to the library. The structure is also equipped with an elevator. The Lastinger Parking Structure is labeled as "P4" on the campus map. Kurzweil 1000: Software program that makes printed or electronic text readily available to people who are blind or visually impaired. The software speaks text aloud in a variety of natural-sounding voices that can be modified to suit individual preferences. Merlin electronic magnifier: this cctv solution was designed to assist those with low-vision by offering magnification and contrast/color settings for text and graphics from print materials. 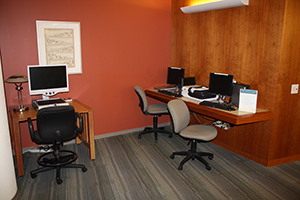 There are three stations are available in the Assistive Technology Alcove, just east of the main stairwell on the second floor. Chapman faculty, staff and students can connect online with a reference librarian for research assistance through out Ask a Librarian form. Library staff can assist in retrieving materials from bookshelves. If materials are needed immediately, please ask a library staff person for assistance. The Circulation Department will be the first department to provide assistance followed by the Reference Staff. Users who have a great number of requests should contact the library in advance. Leatherby Libraries Circulation and Reference staff will assist users with photocopying, using microform reader/printers, and with scanning. Disability Services - this campus department provides further services to students with disabilities. Report an Accessibility Concern - Accessibility feedback for this or any Chapman University Website.